It is easy to romanticize baseball. I vividly remember the 2002 baseball season. This was the first year I watched game after game, becoming engrossed by the finer details of the sport. Before then, I was just a girl who watched Yankees games with her Bronx-bred father. (When I was growing up the Yankees always seemed to be in the playoffs.) 2002 happened to be the year the YES Network, the television channel that revolves mostly around Yankees baseball, debuted. With sudden access to every Yankees game, I could almost certainly be found watching the game. Soon enough I was watching every baseball game I could, renting the Ken Burns documentary, and reading anything written about the game. It’s safe to say for that summer (I was 13) I was obsessed with the summer game. And so I also remember the 2002 Oakland Athletics, how poorly their season began, that infamous 20 game winning streak, and how all anyone could talk about was that A’s payroll was a fraction of the Yankees. Because of all of this, it could have been very easy for me to sit back and be completely enthralled by Moneyball. At times I was. I was struck with nostalgia fairly early on. Moneyball opens with glimpses of when the A’s and Yankees faced off during the 2001 ALDS , games that meant everything to the tri-state area after 9/11. The A’s lost that series, prompting its general manager Billy Beane to make some gutsy moves that would change the game. Once I realized that I knew exactly what was going to happen in Moneyball, I was able to leave my underlying love for the game at the door. Moneyball picks up right after the 2001 ALDS with general manager Billy Beane (played by Brad Pitt) trying to pick up the pieces after the A’s lose three top players. 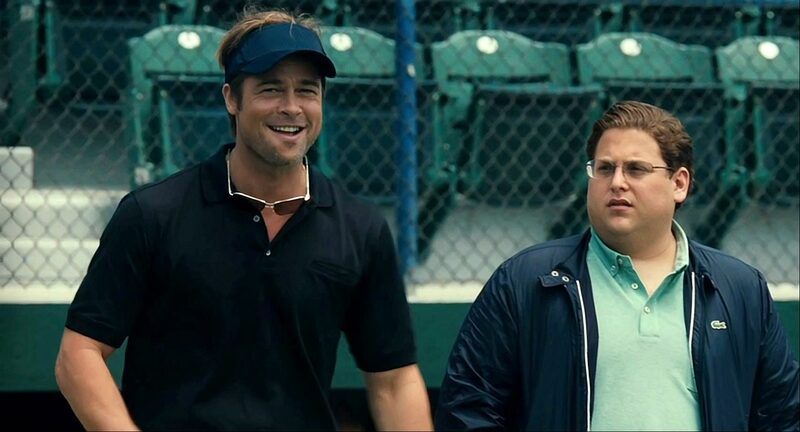 He and his new assistant GM Peter Brand (Jonah Hill) focus on using a sabermetric approach to scouting players. This method uses statistical analysis to eliminate bias and find players who have previously been ignored. Beane’s approach first alienates him from the organization’s veteran scouts and puts him at odds with manager Art Howe (Philip Seymour Hoffman). But eventually things fall into place and the system seems to rebuild the A’s, causing other major league teams to take notice and use it for their own benefit. The strength of Moneyball begins with the montage-heavy direction and a surprisingly sharp script. Bennett Miller helmed the movie while Aaron Sorkin is the big name behind the screenplay. Thankfully the final product is somehow not a mess given the number of directors (two), screenwriters (three), and rewrites the film encountered (two) along the way. Between montages that romanticize baseball and the bigger change at work act, there is a lot of background noise in Moneyball. Then there are the passionate baseball fans who know every detail of the story but still want something fresh. It is Pitt’s performance that grounds and drives the film. With the events in Beane’s life – his early career as a struggling ballplayer, his relationship with his preteen daughter, and his own stake in the team – at the center of it all, you’re given a sense that Beane was the only person capable of successfully implementing this new scouting system. Like many baseball movies, Moneyball romanticizes the sport. This unavoidable. I love the game so I am willing to soak it up. I got chills during a scene at Fenway Park where the camera lingers on the ballpark itself. (Don’t tell my dad this but I think Fenway is best ballpark in the country.) It is fitting then that the final note reminds us that Beane and the Oakland Athletics, despite popularizing sabermetrics, are still waiting to win a World Series. Meanwhile, teams that have adopted this method have won the last game of the season. As much as you depend on probability and as much as you romanticize baseball, sometimes you still don’t win. It may not feel quite like the classic baseball movie others have achieved, but it’s certainly pleasant enough to be enjoyable even by non-sports fan, and features great performances from Hill and Pitt. Good review. Check out mine when you get a chance. hmmm…i wonder if you could like this movie without loving baseball. I think you can. Because I love baseball, I’m intrigued by what the movie is about. But there is a lot of other good things going on – Pitt’s performance, the script, a good montage (I love montages) – that make Moneyball more about just baseball. Recently stumbled across your site Joanna. Great work. 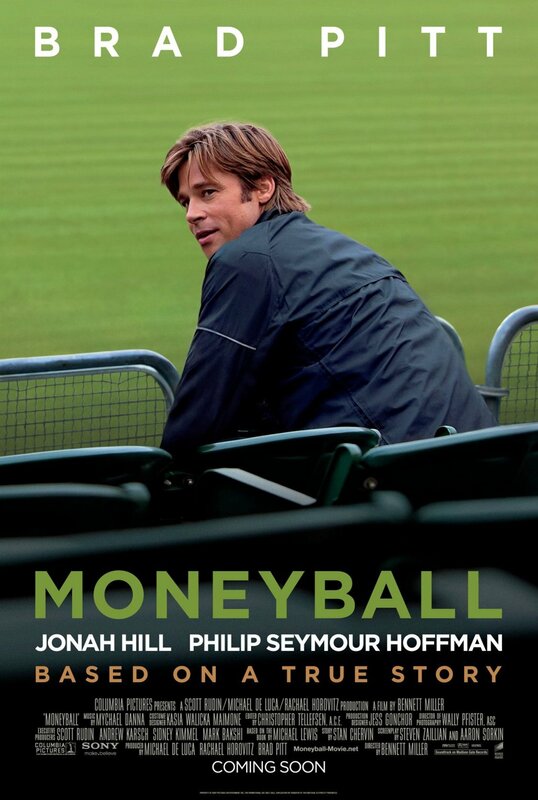 Moneyball isn’t out in Australia until November, but despite knowing nothing about baseball, I do like a good sporting story, and based on the reception of Sorkin’s script and Pitt’s performance, there is plenty of appeal. Looking forward to it! I’m really interested in your take on this movie since liking baseball seems to determine how much you may or may not enjoy Moneyball. Thanks for reading! It has been interesting to note, but some die-hard fans of baseball have been disappointed, due to the film’s inconsistencies with facts and players – while non-baseball fans haven’t picked this up and enjoyed it! So, i’ll see!